In a couple of days, we are officially into the last quarter of the year. It means, we are about to welcome the festive season! From Dussera to Diwali, the special days of this year are waiting around the corner. So, are you ready to up your style game to look damn good on each memorable occasion? Besides that, the weather is cooling down, so it means you can wear all the heavy outfits without the fear of drenching on sweat. If you like to rock this festive season with impeccable array of outfits, then this is the time to plan your shopping. Since it is a no-sweating period, you can expand your horizon and experiment dresses which you would have otherwise skipped owing to harsh climate. We have already started our search to find the best dresses in deals. Of course our search begins with finding voguish sarees to wear this season. 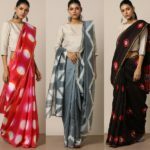 While browsing through all the major clothing retailers to unearth the hidden gems in unbelievable price, we found out slew of stylish designer sarees on Ajio. 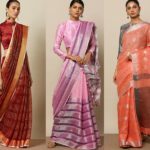 Obviously we want to share the delightful sarees to you as well. Ahead, we have picked 11 cool designer sarees that make a great pick for this season. And the good news is, they all are under the price tag of Rs.1000. Didn’t we say this season is all about plain sarees with embellished border and blouses! That makes this lime green saree with contrasting bright red border an exciting choice to wear. 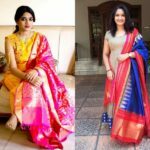 Exciting thing is this saree is accompanied by an embroidered blouse as well. For Rs.914, it is a great deal. Sometimes it’s just the color that does all the cool jobs to your look. This bright orange will brighten up your special days with that extra notch of style. For more stylish appeal, pair it with contrasting designer blouse of your choice! Bring out your artistic side by picking up this simple plain georgette blue saree festooned with a flawless Paithani work on the border. Wear this with a heavy work blouse and see the magic in your look. Do you like to look fabulous just being simple and sophisticated? 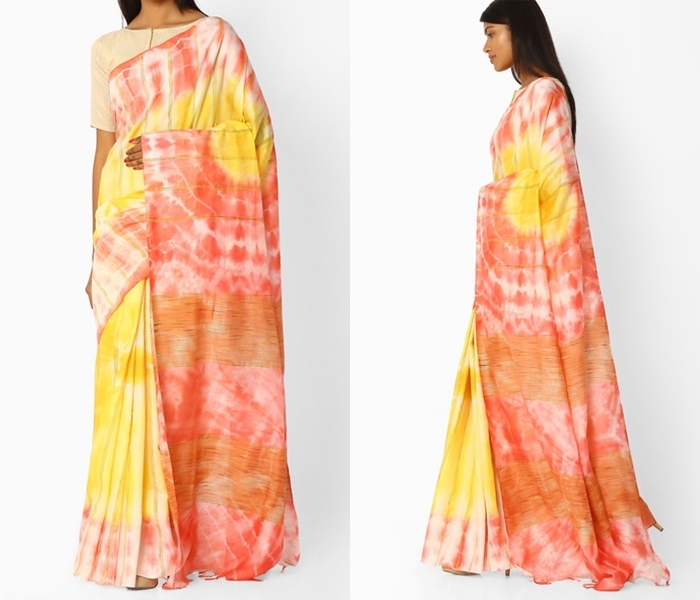 Then try this tie and dye saree splashed with alluring colors. This will instantly make you look fashion forward! Two pleasing mix of pleasant shades will end up in delightful combination like this! Imagine welcoming your family with these bright hues by your side? You are sure set to make a statement on this special day. And this bright beauty is just for the price Rs.589/-. 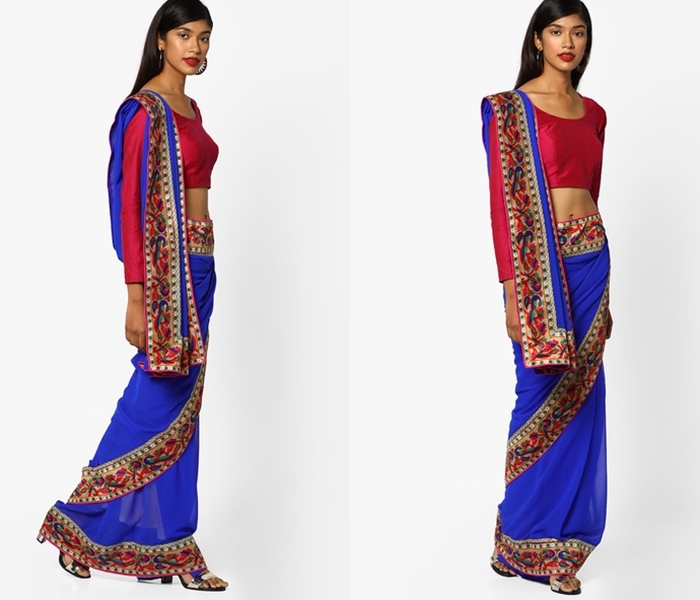 Take a look on this simple plain saree with neat zari lines drenched in royal blue. You really don’t need expensive fusion drapes to bring out the glam side in you; this deal-breaker saree (Rs.600) will do the work for you! A pretty peachish-pink with royally embellished gold border and heavy embroidered blouse is all you need if you have been looking for a modish party wear this season. Opt for boat necks and long sleeves to take this saree to next level. 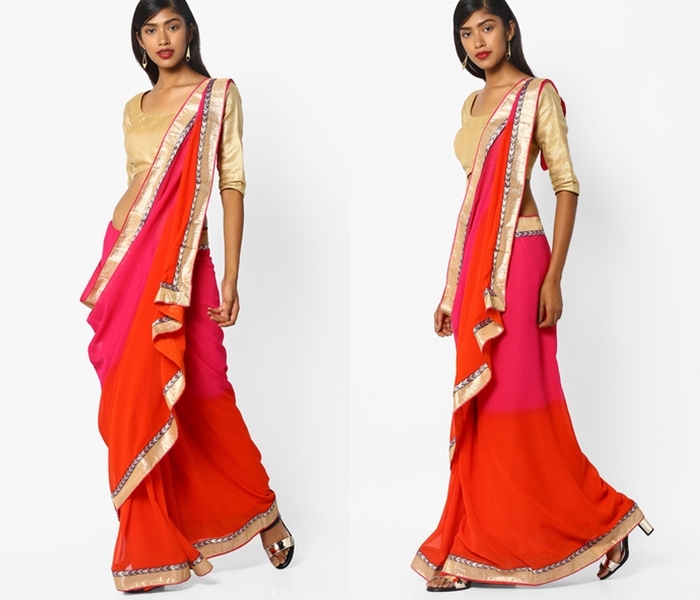 End this saree style with a metallic pumps or heels to balance out your festive look. 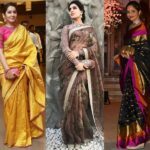 How can our list conclude without few trendy half and half sarees that are reigning this season? If you still have not tried out this trend, this dark brown beauty with gota detailing on the broder will pique your interest. Above all, it comes with a fantastic deal of Rs.810. While it is perfectly fine to look all traditional in the coming functions and parties, it is also necessary that you stand out from the crowd by opting for few creative drapes. 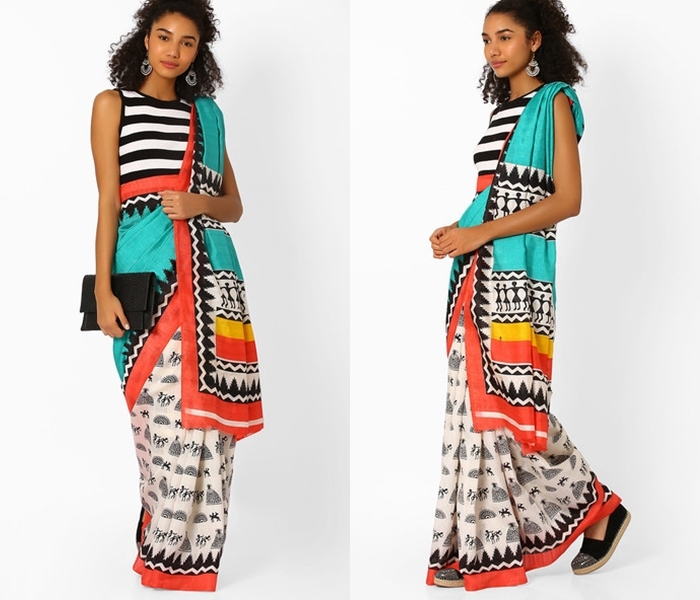 This printed Bhalgalpuri saree will bring that WOW factor on you! Wear this beauty with fancy black blouse to round off this saree style. Here is another alluring half and half saree with feminine detailing and elegant embroidery. Wear this saree to bring out the royal look on you! 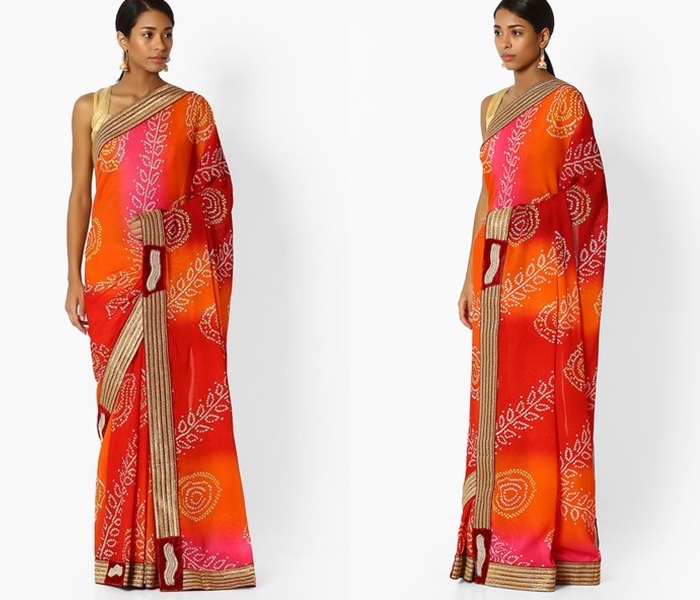 Replace your majestic silk saree with this bright vividly printed multicolor drape highlighted with embellished border. The glittery gold blouse that comes along with this saree is a winning piece as you could literally pair this with any other party-wear saree as well! 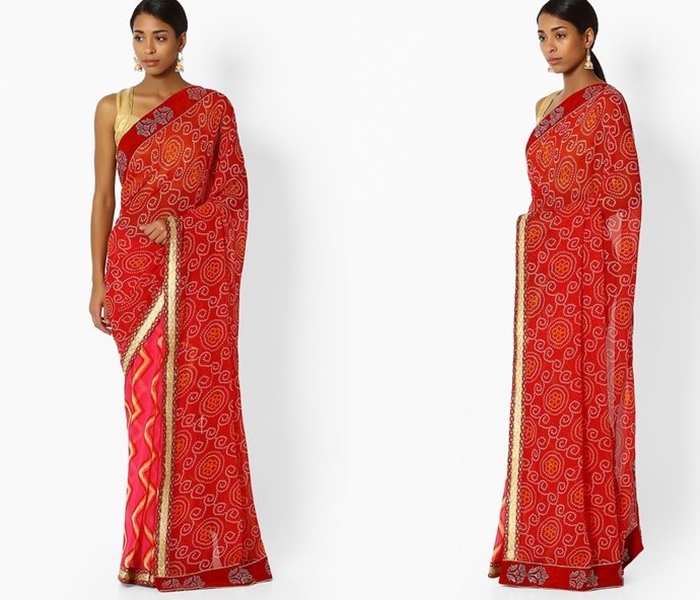 These are our picks of designer sarees from the enticing saree collection on Ajio. 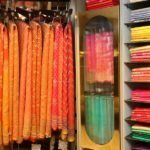 All these sarees are under the price tag Rs.1000. 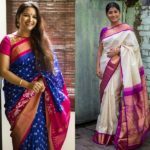 Shop these and lot more affordable sarees here. Grab the sarees when the offer is still ON. And don’t stop just there. Plan you blouse style, give ample time to stitch it. Prepare for apt accessories. Decide on your makeup and hairstyle. Needless to say, look best on the D-day! Let us know what your picks are for this festive season by dropping your comments below.